The Consortium for Japan International Asset Management Center Promotion (JIAM), in collaboration with KPMG and Tokyo Metropolitan Government (TMG) organized Singapore FinTech Roundtable and Networking at KPMG Experience Centre on Wednesday June 6th, 2018. 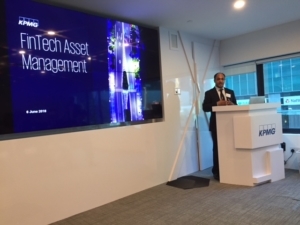 KPMG shared about his vision on FinTech for Asset Management. TMG introduced Global Financial City Tokyo and its fintech initiatives to attract more fintech companies to Tokyo. And JIAM touched on how fintech can transform the investment value chain in Tokyo. Our deepest gratitude to KPMG for hosting and contributed in the success of this roundtable. Below few pictures of the event.